If you want to join this great organization of Catholic men, you will find brother Knights working to fulfill the central mission of the Order; striving in charitable works; serving the Church and unified in following its teachings; supporting brother Knights in their temporal and spiritual needs; acting for the good of their country; and giving aid to widows, orphans, the sick and the poor. This is Father McGivney's dream, echoing across the century, and living today in the hearts of his brothers and all of those they touch. Welcome to the Villa Maria Council # 6342 of the Knights of Columbus. 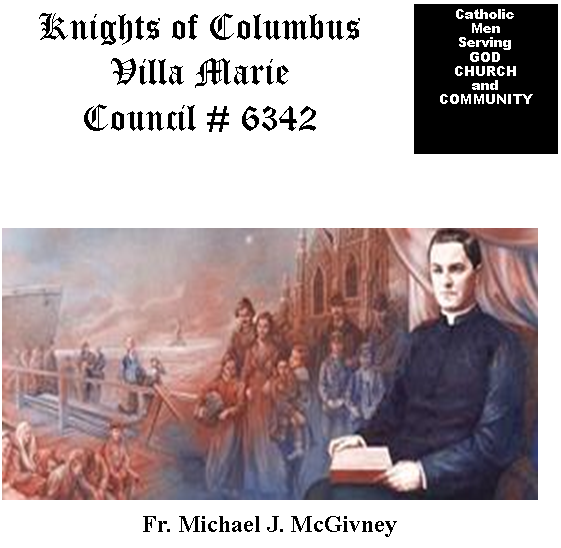 Father Michael J. McGivney and a handful of Catholic laymen founded the Knights of Columbus in 1882, in the basement of St. Mary’s Catholic Church in New Haven, Connecticut. The aim of the founder was to set up a parish-based lay organization that offered insurance benefits to the widows and children of members. In an era when parish and fraternal societies were popular, Father McGivney felt there should be some way to strengthen the religious faith of his flock and provide financial support for families overwhelmed by illness or the death of the breadwinner. Today the Knights of Columbus have grown from that one local unit, or council, to over 12,000 councils in the United States (including Puerto Rico and Guam), Canada, Mexico, the Philippines, Cuba, the Dominican Republic, Panama, the Bahamas, the Virgin Islands, Guatemala, and Saipan. In January 2006, the Knights of Columbus expanded to Poland. Membership is over 1.7 million members, plus their families - approximately 5.6 million people total - many of whom are actively involved in volunteer service programs for the Catholic Church, their communities, their families, young people and one another. One of the primary missions of the Knights of Columbus is to support local charities. The Knights are a familiar sight around town during the annual Mentally Challenged Citizens drive, which raises funds for charities that support the retarded and handicapped. We also support other fund raising drives to aid local parishes and charities. · Knowing that the Knights of Columbus is second to none in support of our Holy Father, our Bishops and Priests, and our fellow man.